This ‘poor man’ Sicilian pasta dish is simple, quick and ingredients will often be found already in the pantry. Fill a large pot with plenty of water and bring to the boil. Once the water starts to boil, add a generous pinch of salt and the spaghetti. Cook the pasta until it’s al dente, according to the packet instructions, stirring every so often. Drain well, reserving a cupful of the cooking water. Heat some oil in a pan set over a medium heat, then fry the breadcrumbs until they are crunchy and golden and have absorbed all the oil. Heat a little more oil in a separate large pan set over a medium heat. Add the garlic and cook for 30 seconds, until fragrant, then add the anchovies and capers and reduce the heat to medium. Let it cook for few minutes, then add the tomatoes and a pinch of chilli flakes (if using). Add the drained pasta to the pan with the tomatoes and allow it to heat through. Add some of the pasta cooking water if the sauce is too thick. Add three-quarters of the parsley and three-quarters of the breadcrumbs and stir one last time. 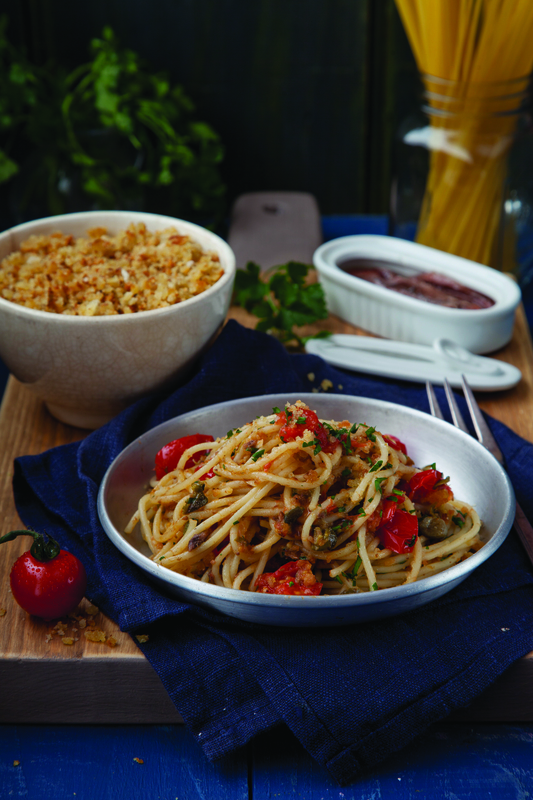 Divide the pasta between six pasta bowls, garnish with the remaining parsley and breadcrumbs and serve.